KEM? Arrow Narrow Standard Playing Cards are fancy, functional fun show up to game night in style with the Arrow Narrow deck from KEM?. Virtually impossible to mark, dent, or crimp, KEM? cards are made of a unique blend of paper and plastic that provides superior flexibility and strength for longer lasting use. Though these KEM cards are said to impossible to mark, our technicians spent a lot of time and energy studying to mark the KEM Arrow cards. We try and fail and try again. 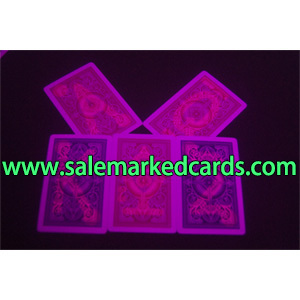 Our experienced technicians do finally get a way to make the invisible ink KEM marked cards well. Though we need some time, we can make the best KEM Arrow marked cards so far! Just tell me if you have some requirements about the KEM marked cards. For example, do you need only the numbers? Do you need special signs for marks? We can usually try to meet your needs. 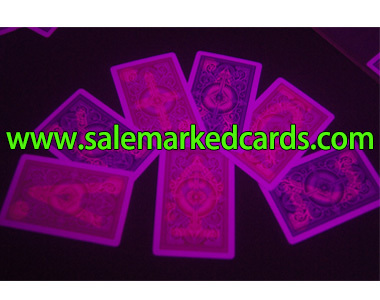 And if no special requirements, we will mark the KEM cards with invisible ink marks like that in the following picture. KEM Arrow playing cards are in double decks of narrow size. Usually red deck comes with blue deck in one set. And the narrow size KEM Arrow cards have standard index.